Make completing reading logs a breeze by providing your students with different sentence starters for each entry. This reading log template is completely editable, which means you have the option of changing the entry spaces to suit your needs. As an added bonus, a digital version is also included! Reading Log with space for summary, date, beginning/ending page numbers, and time spent reading. Can be for DEAR, SSR, or for a home reading log. This is a basic weekly reading log that I use with my upper elementary school students. Students are required to put the title of their book, minutes read, and have a parent sign it. They are also required to write a brief summary about what they read. This reading log is given to the students each week as homework. They fill in one section a night and then at the end of the week they write a summary. Part of it is graded as a reading grade and the other part is for writing. This is a great template to use for independent reading. Students will record pages read and give a summary as well as personal opinions. The student has an opportunity to rate the book and recommend to a friend in a short summary at the end. Independent Reading Log with Summary! Weekly Reading log for students to track their daily reading at home. There is space provided for a daily summary to include main idea and 2 supporting details for each day, even weekends! This sheet would be great for a literacy center. After reading a book, kids can fill out this log page which keeps them accountable. If you wish to grade it, each section, including their name, is worth 10 points. This is a page kids can fill out after reading a nonfiction book so they can be accountable for their learning. It would be useful in a literacy center. If you wish to grade it, I recommend giving each section, including their names, an eleven point value and awarding one point for neatness. Reading Log & Summary Sheet - Summary Sheet FREE! Have students use this reading log each night (Monday - Thursday) to write a summary of what they read at home. 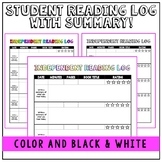 This is an independent reading log for students to use while reading at home. Students must include a summary or reflection each night that they read. 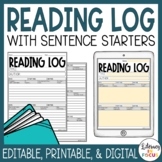 This "Home Reading Log" is a perfect way for students to record their nightly home reading. Students will record the title, pages read, lexile and summary. There is also a section for parents to sign and record the number of minutes their child read. This is a weekly reading log with summary.